It is not necessary to spend a fortune on unique wedding centerpieces . There is no reason you or your family and friends can't make them yourselves. Take a walk through a discount or craft store and look for different containers, candles, decorative pebbles, or anything else that by color and style, that would fit your wedding theme. Buy flowers of your choice and arrange them as inspired. If you have a group, there should be plenty of inspiration and ideas from their own weddings. Don't think you have to stick to traditional flower and candle themes however. The seasons can be a big help in hitting the right note with your centerpieces. For spring, perhaps an Easter Tree - a budding branch with little Faberge style eggs in your color, for decoration. They need not be expensive  for example you can by a box for a few dollars each. 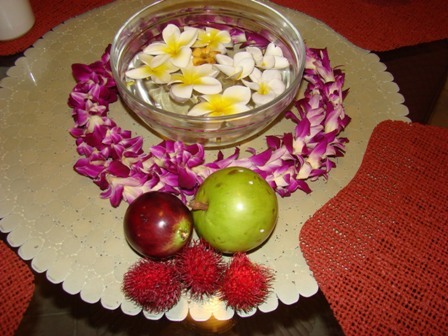 Food can be used as an inexpensive, yet attractive centerpiece. For summer if it's an outdoor wedding, try a tropical fruit plate, cut into clever designs that your guests can actually eat. For fall, decorative squash and leaves. Christmas, you can have a selection of beautiful cookies, with seasonal embellishments in your color theme, that you encourage your guests to take home. 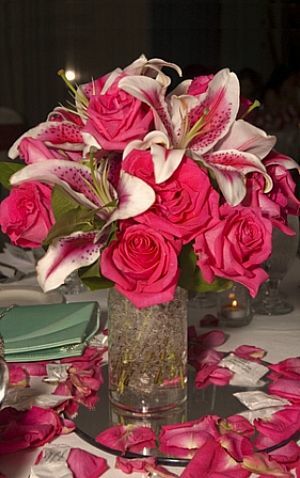 You can also use your centerpieces to double for other items that are an expense. Looking for more unique wedding centerpieces - Instead of a cake, have a cupcake tree, (you can get them inexpensively). If you are serving wine, get an eclectic group of crystal glasses from garage sales and home stores (less than a dollar or so each) and tie the stem with ribbon. Arrange with the bottle on the table. By keeping it personal, who you are, matters more than money spent. As well as trying to fit the color theme and style of your wedding, emphasize what brings everyone together to celebrate your great day. Let your love for each be your inspiration and you will come up with something warm and memorable!